It’s that time of the year again – the much anticipated winter school holidays are just around the corner and the humpback whales are already relishing the change in season as they begin their annual Great Migration. 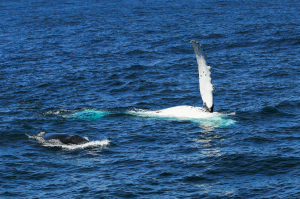 Their expedition generally starts from the end of May and by mid-August the whales are beginning to head back south with their newborn calves; it’s around this period where they tend to spend more time on the surface and swim slower (so the calf can keep up). Made up of 26 golden sandy beaches this pristine ‘blue water paradise’ of Port Stephens on New South Wales’ mid-north coast transforms into a whale-watching hotspot, welcoming hundreds of the magnificent marine mammals to its sheltered waters each year. Home to the largest and most scenic marine park in the state, and a luxurious fleet of vessels, Port Stephens provides for a breathtaking day out on the water. Sydney and its surrounding coastline offers countless vantage points, but a favourite among locals, and just a short ferry ride from Circular Quay or stroll from Manly, is North Head. Situated on the northern-most edge of the Harbour with breathtaking panoramic views of both the Harbour and Sydney skyline, you’ll want to spend all afternoon here – be sure to pack a picnic. The Gold Coast’s seaside hub of Coolangatta provides holidaymakers with plenty of opportunity to spot the whales – without splashing the cash. With several whale-spotting viewpoints dotted along the Gold Coast’s southern beaches, including Kirra, Burleigh, Greenmount headlands, and Point Danger – there’s a free show for all. Further north and just 30 minutes out of Brisbane, the Redcliffe Peninsular is also renowned as a whale-watching haven, perfect for those planning a weekend away and wanting to see the whales in Moreton Bay. This holy grail of whale watching provides tours for all budgets and sailing preferences, with many guaranteeing 100% sightings. The migration route of these Southern Hemisphere Humpback Whales brings them within close proximity to the Sunshine Coast shores, but there’s nothing quite like experiencing the magic of getting up, close and personal with a whale. With peak season on the Sunny Coast running from July to November you’re almost guaranteed an impressive show, with several charters leaving daily.